About the nail art, I used tape strips to make the aztec pattern, what else, right? ;) The white is Essence Stamp Me! White and the red is OPI's Big Apple Red. Yes, it took me forever to make, haha, but I'm quite patient when it comes to nail art, so I'd do it all again in a heartbeat. 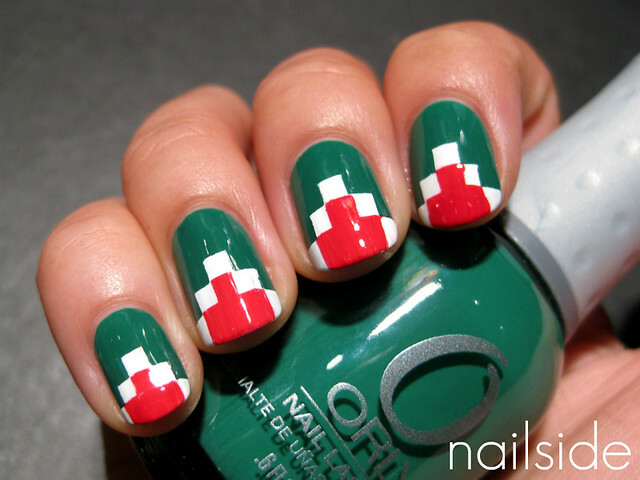 Though using it as an accent nail would be a nice compromise, like the polished perfectionist AmyGrace did here. Accent nail FTW, right! She's awesome. And that's it for this post, good night! Wow! This is awesome, YOU are awesome, love it! How fun! Now I want to re-do my nails! Very cool! I Never seen anything like this! I have no words -it's amazing! Gosh! This looks so cool! You won't believe how many of your nail pics I have in my "inspirational folder". Lol! *blushes* Thank you so much for the compliment, you're sweet. ^^ Lóve the pixel nails, I'm awed by your patience and skills! I like the design a lot, but not the color scheme so much. I think it would look awesome with black, white and red, or maybe silver. I like this design! And thanks a lot for the comparison! I am glad I didn't buy Lucky Duck the other day as I already have JITNB - they're just too similar to have them both. Wow this is great! you must have a lot of patience. Great job it came out so cute! I wish I had your patience! So pretty! !